Todd Rundgren – But Is It Any Good? LINEUP: Todd Rundgren solo on sides 1-3, Rundgren with help from people like Rick Derringer, Randy Brecker, Mike Brecker, Vicki Robinson, Amos Garrett, Billy Mundi, Ben Keith, Toby Sales, Hunt Sales and more on side 4. WHAT’S IT ALL ABOUT: Long, sprawling double album that shows off Rundgren’s prowess as a musician, songwriter and producers. SOME WORDS, PHRASES AND CLAUSES ABOUT THIS RECORD: This record is probably the best showcase for all sides of Todd Rundgren. For most of the album, he played, sang and produced everything all by himself. He learned the drums and bass just for this record and recorded some experiments at home on a VCS3 synth. His sense of melody and his knack for hits is evident in “I Saw the Light”, but throughout the rest of the album, the songs are rich and dense, and the hooks and melodies sneak up on you as there’s layer after layer to unpack. Side four was kind of a loose jam after he relocated from LA to NY thanks to an earthquake. He had too many tracks for a single record, so most all of side four he just set up shop, had people come in, and they learned the song and recorded it quickly. In contrast to the tightly wound and produced first ¾ of it, side four is like a refresher. It also contained “Hello, It’s Me”, the big hit and a remake of an old Nazz song. The only notes I have is that it’s a long slog, and some of the songs on Side 2 and 3 tend to go on a bit long and get caught in overproduction. Still, listening to this gives you great appreciation of Rundgren, and of course the fact that almost all of the tunes are top notch helps. NOTES & MINUTIAE: The song “Wolfman Jack” was released two years later as a single in a version with the Wolfman himself. GRADE: A: A great exercise in songwriting and production, and a primer on how to use a studio for the best possible effect. LINEUP: Todd Rundgren, mostly. Tony Sales, ND Smart, John Guerin, Hunt Sales and Jerry Scheff did bass and drums work through the album. 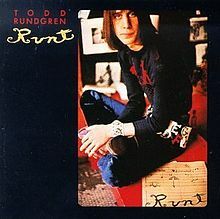 WHAT’S IT ALL ABOUT: Rundgren decides to scrap the band identity, kinda (Runt is still listed as the ‘artist’) and puts forth an effort showcasing most sides of his musical idiom. SOME WORDS, PHRASES AND CLAUSES ABOUT THIS RECORD: Todd Rundgren, by this, time, knew the only way he could ensure the sound he heard in his ears wound up on record was to record everything himself. He was unsure about bass and drums, so he enlisted session guys for those (and the Sales brothers – his old ‘Runt’ bandmates). It’s not a tour de force, but it’s an excellent and varied album. He has a knack for pretty ballads, outright rockers, and pop songs with hooks, lots of hooks. His lyrics are also as varied as the music. “The Range War”, a clever telling of lovers caught up in the cattle vs. sheep war in the Old West, is one example. Rundgren showed he was a unique performer, and while this isn’t one loaded with hits or airplay, it’s fascinating through and through. NOTES & MINUTIAE: There was talk of releasing both of this solo albums together, but he decided he’d rather release new material in 1972. GRADE: A-: It’s a clever, quirky and fun record – cover photo notwithstanding. WHAT’S IT ALL ABOUT: Rundgren’s first ‘solo’ work after leaving the Nazz establishes him as a quirky songwriter who dabbles in many genres and styles and also is a production whiz kid. SOME WORDS, PHRASES AND CLAUSES ABOUT THIS RECORD: On first release, this was credited to the band Runt, which was Rundgren and the Sales brothers. However, it really is the start of Todd Rundgren’s solo career in all practicality. Rundgren did everything but bass and drums. And yes, those are the same Sales brothers that were part of Tin Machine with Bowie. While not as elaborate as some of his later works, this album is a great progression from the Nazz as Rundgren was able to experiment and dabble in many styles. Some of the cuts don’t work because they are too outre, but there was vision and craft in all of it. His songwriting was still developing, but he had a sense of melody in place, and his production, as you would expect, is flawless. Not a great album by any means, but there are lots of good stuff and the single is classic and should have charted higher. NOTES & MINUTIAE: When they re-pressed the album, Ampex (the original record company) grabbed the wrong tapes and pressed up a 12-track album with alternate mixes and two additional songs. Whoopsy! Instead of recalling them, they just let them sell through – those are collector’s items now. IS THERE A DELUXE VERSION: Yes, not streaming, but the whoopsy above is part of a deluxe set..
GRADE: B+: A few experiments don’t work, but anyone who likes even one Rundgren song should give this a spin.